A youth group known as the Benue Youth Alliance For Ortom 2019 (BYAFO 2019), has vowed to continue to stand with Governor Samuel Ortom in his efforts to give a new direction in the Nigeria’s Food Basket State in spite of the persecutions he is facing. 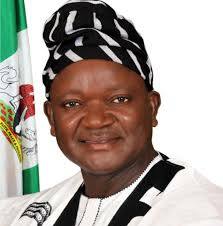 In a statement issued by the National Coordinator of the group Iorliam Shija on Tuesday in Makurdi, the Benue state capital, the youth group pushing for the re-election of Governor Ortom in 2019, said that no political leadership in the state will be acceptable outside that which is provided by Governor Ortom. This statement is coming on the heels of the revelation by the Governor on Monday that he has been shown the “Red Card” by his current party, All Progressives Congress (APC), on whose platform he came to power in 2015. Shija noted that Governor Ortom’s presence on the political stage in the state is reminiscence of what was obtainable in the First Republic when late JS Tarka attempted the definition of minority rights in Nigeria. “Since the era of Tarka, clear agenda and focused political Leadership have eluded the state until the emergence of Ortom. Hence, the need to spare him persecution by selfish politicians, whose actions are anti-people has become the duty of every Benue Youth. “We have tried those who in their estimation feel they are leaders in the state but they have failed us. What do we get as a result of that? Underdevelopment, lack of clear-cut agenda and direction to move the people forward is what we have witnessed. “Ortom must be spared the ongoing persecution. When has it become a crime to stand by the people, whose mandate you are holding in trust? We are satisfied with the unwavering determination of our Governor, His Excellency Samuel Ortom to securing the future of our state at the expense of his comfort and political career.” he noted. The group assured the Governor that they would always stand by him and with him to the end in his desire towards giving a new lease of life and direction in the state. The group also promised to move into every nooks and crannies of the state to mobilize against selfish politicians, who because of their personal ambitions, want to hold the state back.